Ladies Longline Cardigan Size 14 Next. Dispatched with Royal Mail 2nd Class. Next V Neck Button Detail Stripe Lambswool Jumper Size 12 - Pink / cream Lovely lambswool jumper with pretty button detail to v-neck and three-quarter sleeves. Shades of coral, baby pink, cream, bkue, beige, brown. Looks great with denim. Worn twice and in very good condition. Any questions please ask. Also selling in the teal green colour-way. See my other items. Next V Neck Button Detail Stripe Lambswool Jumper Size 12 - Teal Green / Grey. Lovely lambswool jumper with pretty button detail to v-neck and three-quarter sleeves. Shades of teal green, duck egg, grey, cream and brown. Looks great with denim. Worn twice and in very good condition. Any questions please ask. Also selling in the pink colour-way. See my other items. A beautiful soft cardigan to wear with all your'e favourite dresses and more. Unworn still has bag with spare button. 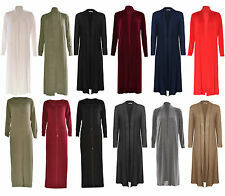 Ladies Longline Cardigan Size 18 from Next. Next Ladies lovely long White Jumper Size 16 Thin knit. Next Ladies lovely White Jumper Size 16 has some flare in the cuffs of the sleeves . It's thin knit great for warmer weather. Pit to pit:18", shoulder to hem:23". size 6-8 ( shrinking form size 10). Womens NEXT Jumper Hoody Size 14 Burgundy Red PREOWNED - only worn handful of times great condition! Casual Jumper Dress size XL from Next only worn once. Soft and comfortable chunky knit jumper with thick, criss cross lacing at the back. NEXT LADIES CARDIGAN. BLUE AND GREY STRIPED. SHORT SLEEVES. Womens Next Size 20 Pink Waterfall Cardigan. Looks like the cardigan in inside out as the seems are on the outside but thats the style! Blush Pink & 100% cotton so great for slipping on on chilly spring/summer evenings. Condition is Used. Dispatched with Royal Mail 2nd Class. Amazing condition drape cardigan, lovely dark grey and beige aztec knit, boho style! Longline drape front, shorter at the back. Fits 10 and 12. Used lightly, in excellent condition. Beautiful cardigan. Sad to let go, but need to de-clutter. 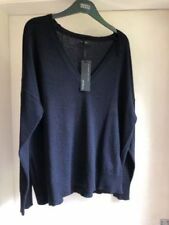 Woman’s Next Black Jumper Size 16. Has thin ‘blouse like’ sleeves. Very pretty. Excellent condition. Soft open cotton cardigan from Next. Size 12 in navy color. LOVELY NEXT CARDIGAN WITH MOCK BLOUSE. CREAM CARDIGAN WITH RED FLORAL BLOUSE. Next long cardigan - white. Next beige butterfly & floral print 3/4 sleeves thin knit jumper with button shoulders size 14 new. New! Next Ladies Fine Knit Grey Sweater With Sparkle neck trim. Size 8. Dispatched with Royal Mail 2nd Class. Next - - Grey & White Striped Long Cardigan with Ruffled Trim - - Size 18. Open Cardigan no fasten —— Lightweight Condition is Used Dispatched with Royal Mail 2nd Class. LADIES BUNDLE OF 2 JUMPERS Grey jumper with black embellished collar from Principles Floral patterned jumper from Next Both size 14 FREE Per Una cardigan with decorative different buttons down the front. I am just hoping someone likes a freebie and likes the cardigan. The cardigan is size medium. Next black and silver cardigan size 12. Not worn. UK delivery only. WOMENS HEARTS PRINT KNITTED Jumper suitable spring/autumn rockabilly 1940’s/50’s LADIES SWEATER TOP PLUS SIZES 16 Condition is Used. Dispatched with Royal Mail 2nd Class. NAPE OF NECK T BOTTOM - 29". Long Striped Ladies Cardigan Size 14 by NEXT. This item is fine for size 12. Brown, purple, blue stripes with 5% metallic yarn. 44%wool. 41% acrylic. 7% viscose. 3%polyester. Wash 40 degrees as wool with colours inside out. More on the purple rather than blue side. Length is about 46 inches and below the knee. , 24 inches shoulder to cuff. 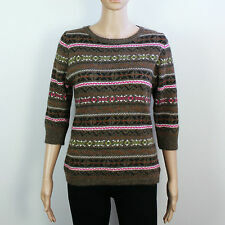 LADIES NEXT SHORT SLEEVED KNITTED TOP SIZE S. HAS NEVER BEEN WORN. Ladys Next Black Chunky Knit Poncho Size M. Condition is Used. Here is for sale blue and white jumper in size 10/38. It is a casual style jumper. A must have. This has been worn but it is in the very good condition. There are no stains or marks. Sorry for the picture quality it is due to the camera fault. If you have any questions please ask. An item is frome smoke and pet free house. Please see my other baby items for sell. Thanks for looking.